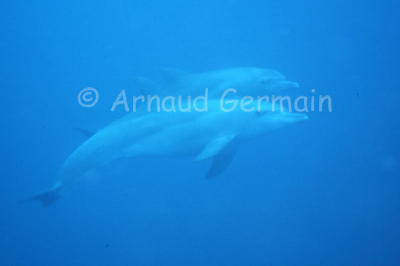 As we were reaching the mid point of the dive and were thinking of turning around, three bottlenose dolphins suddenly appeared. We had heard them during the morning dive without seeing them. There was a juvenile and two adults. The young one wanted to play with us and came close, the adults trying to push him away. I managed this shot and the film in my camera jammed. The encouter lasted a good ten minutes before they disappeared. We had very little air left in the tanks when we reached the boat, but it was well worth it: it is not often that dolphins are that playful with divers!